iPad accessories have been coming at us from all directions since April. We could tell you about all of the gear we have seen, but then we would not have time for anything else. Instead, we like to filter out the noise, screen out the unworthy, and cut though the clutter. The gear that make it past the gaunlet are the ones we tell readers about. While the iPad is designed to be used while being held, sometimes you want to put it down somewhere, especially when typing or using it to watch a movie. In those situations, it is best to put it on a stand. We looked at one a few months ago. Today, we’ll take a look at another. Today is our FirstLook at the LapWorks iPad Recliner. No, it is not a comfy chair from La-Z-Boy. However, with it you can sit back, put your feet up, and position your iPad in a variety of positions. The Recliner cradle is molded from high impact plastic. It has an angled wedge for a base. The base is attached to the cradle and held in place via a twist knob. There is rubber padding on all of the appropriate contact points that holds things in place and keeps things from sliding. Adjustments are quite easy to make. Once tightened, the cradle is held securely. While there are technically an infinite number of angles which the Recliner can take, there are three basic positions (upright, middle, low) for most practical purposes. We found the upright position best for watching movies when our feet are up on the desk. The middle/low angle worked well for reading and typing. Of course, the actual ergonomics depends on the user’s height and whether they are standing or sitting. The base extends quite far back, so it is difficult for the the Recliner to be tipped over backwards. An iPad, in any orientation, cannot be tipped over when on the Recliner. The base is rubber coated to prevent slipping of the iPad in either horizontal or vertical position. 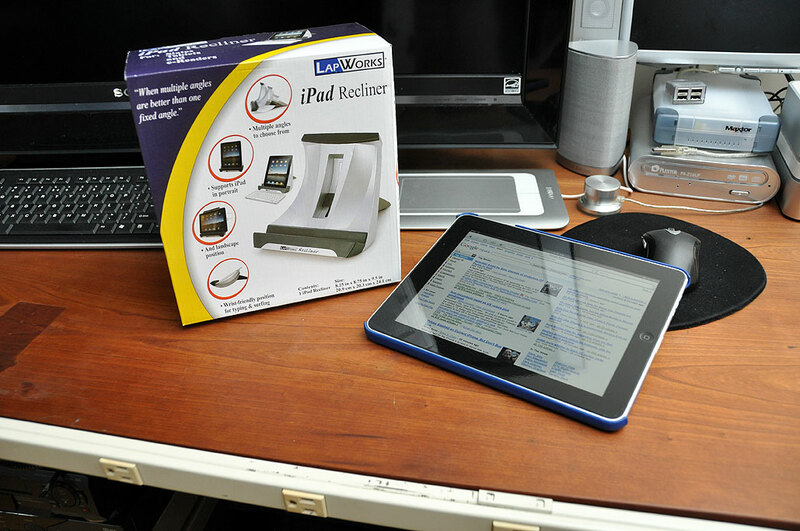 The Recliner is sized for the iPad, but will easily accommodate any e-reader, tablet, or even a light-weight laptop. We have two stands in the office for the iPad. The laptop stand from TwelveSouth and this Recliner from LapWorks. 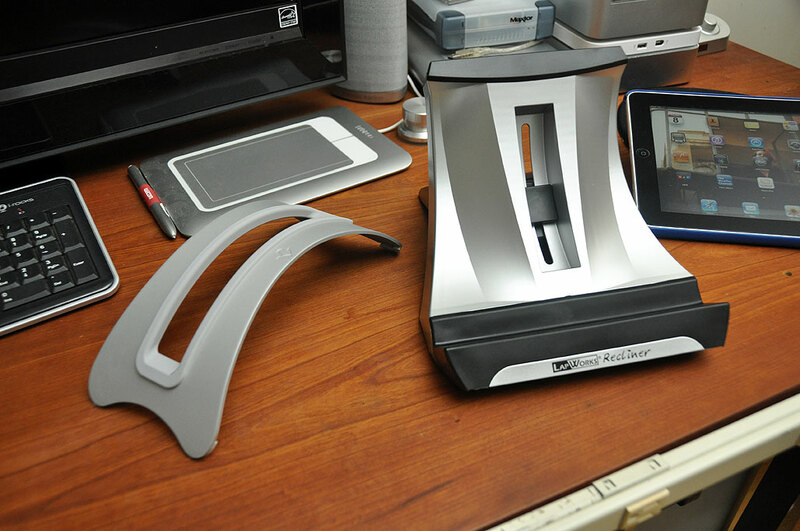 From the purely esthetical point of view, the BookArc is much “cleaner” looking. However, the Recliner is definitely more versatile. Sometimes form wins over function, but in this instance we will probably side with the latter. We’ll let you know in a few months.